Mask with P100 filter accommodates more challenging work environments, where exposure to lead, oil-based aerosols and molten metal fumes may be prevalent. Cool Flow™ Exhalation Valve minimizes moisture and heat build-up. Contoured faceseal and adjustable noseclip provide added comfort for extended wear. 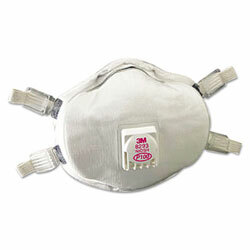 Respirator Type: Half-Face Mask; Rating: P100; Valved: Yes; Adjustability Features: Adjustable Straps. Disposable Respirators and Face Masks from 3M! 5001 In Stock today.